Description: THIS IS A SIMSON - DWM REWORK GERMAN LUGER RIG, 9MM. 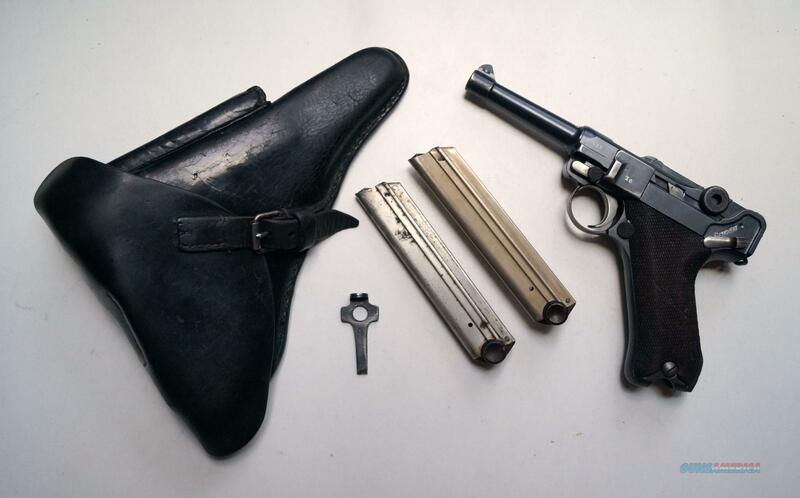 THE LUGER IS IN GOOD CONDITON, ALL ORIGINAL, NUMBER MATCHING, VERY GOOD BORE AND GRIPS, MECHANICALLY CORRECT AND TIGHT.THE RIG CONSISTS OF THE LUGER, 2 ORIGINAL MAGAZINES, 1 ORIGINAL GERMAN LUGER HOLSTER AND 1 ORIGINAL SIMSON PROOF MARKED LOADING TOOL. A VERY NICE RARE SIMSON - DWM REWORK GERMAN LUGER RIG. A MUST LUGER FOR ANY SIMSON COLLECTION. NOTE: AFTER WWI SIMSON SUHL THRU THE VERSAILLES TREATY WAS GRANTED TO BE THE ONLY MANUFACTURES AND REWORKER ON GERMAN LUGERS ANY SIMSON LUGER SHOWING THE SIMSON PROOF MARKS IS A RARE FIND.